Today I'm meant to be doing a Feature Friday, but all my mail came too late in the week to go out and photograph, so unfortunately, it'll have to wait until next week. I decided to discuss something that I pretty much always get asked, and always feel ashamed to answer. 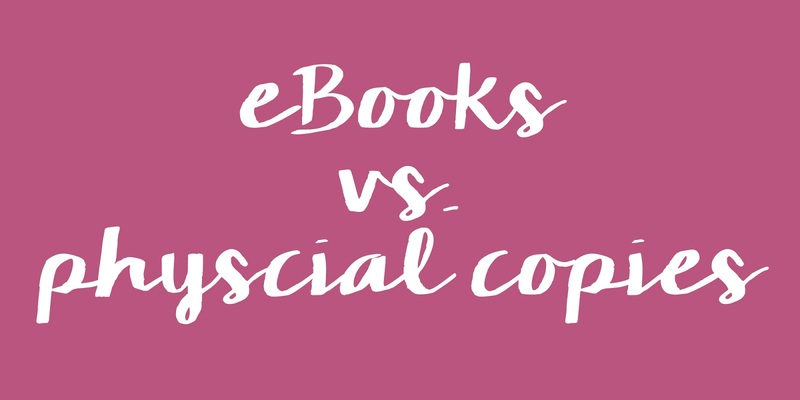 I feel as though there's a HUGE issue with eBooks, one that people who use eReaders may take too seriously, but some readers feel as strongly about physical copies as they do about dog-earring pages, and breaking spines*, and that is not always so well received. There are many, many, many, many, pros and cons to both. And then, there are pros and cons to having paperbacks or hardcovers, iPads or Kindles. It's the kind of topic that has so many sub-topics that you could pretty much write an entire book on the matter. *I just wanna say here, your book is your book, if you wanna dog-ear and break spines, do it. If you want to annotate, or leave cute messages, do it. If you want to tear your favourite page of a book out, highlight the entire thing and paste it to your bedroom wall, you do it. No one needs to give you permission. Personally, I use eReaders and tablets, I own a Kindle Paperwhite and an iPad Air 2, to read my books for a couple of reasons. Firstly, books are freaking expensive. My method of reading is simple, I read the eBook first and if I enjoy the book enough I buy a physical copy (hardcover or paperback depends on how pretty they'd be, haha), and let's be real here, I'm supporting the author twice by doing this. Secondly, for the past year I have moved between my parents house, my sister's house, my future in-law's place, and now I'm in a flat with my fiance, so there's never really been a whole lot of space to store the amount of books I acquire in a year, and imagine moving all those books on and off of shelves... No thank you. Now that we're settled in our own place I'm buying more books (far too many if you ask Josh, but what bookworm can resist book buying in any form?) and that's because I have the space for them. Finally, I love reading on my electronic devices! (Shocker!) I love that you can turn endless scroll on in iBooks, that the Kindle app allows all your devices to share the same library, that if it's pouring down with rain I don't have to walk/run to the bookstore to pick up the next installment of a book. I love that there's never the wrong reading light, because the Kindle app and physical Kindle will tell you how bright/dark to have you screen, that you can have a white, sepia, or black background, that you can change font size and colour, that if I don't know what a word means, I don't have to Google or pick up my phone (because Instagram is usually waiting to distract me! ), I like that I can read on my phone if I'm stuck somewhere with no music, that they're light enough to fit in my handbag and I literally have millions of books at my fingertips. That there are apps like Scribd (read more here) that's like Netflix for books, that if I switch devices it remembers where I was and asks if I'd like to jump to that position. That if you hate the cover you've got on your eBook, you can literally change it so easily, that I can never lose my place, that I don't need to scramble around for a bookmark when something distracts me, I could literally go on and on for years. I know that there are down sides, the one that is most often pointed out is battery life, and yes, of course you can't have an electronic device run forever like a physical book. But, if you think about the fact that, if you're at home, you can still read while it's charging and if you consider that when you're out and you finish your book, the time between reads, for any reason, could be considered 'charging time'. Any time you don't have the book you want to read in your hands because the store didn't have the right version in stock, you forgot your book at home, you finish a book mid-journey, or anything else, can definitely be considered 'charge time'. It's 2015, pretty much every library, cafe, school, Uni, even bus stations, have sockets where you can charge your device if you need to. If you're not constantly opening other apps, and you don't have your screen too bright, reading on a tablet doesn't actually use too much battery. And Kindle swears that their electronic ink devices have a 2 week battery life if you read 30 minutes a day (I know you're reading more than that, but you get me) and I can say that I rarely ever needed to charge my Kindle. I have personally been called out for doing both kinds of reading. Once, at high school, I was asked why I read so much if I'm "all 'go green', don't you think books are a waste of paper?". I worked at an organisation that specializes in saving the planet (not mentioning names), and someone in a different department than me asked me how many trees I thought went into making my books. I've been called a 'fake bookworm' because I own an eReader, and been told that I "didn't really read the book", um, yes I did? There is definitely nothing better than holding a book in your hand, seeing full bookshelves, than getting to browse bookstores, and having that book smell float up every time you turn a page, but not everyone has the opportunity to access physical copies every single book they read. To be honest, guys, I'm not even fighting for either side (though, it kind of looks like I'm on the electronic side of things, I know.) I'm kind of just tired of bookworms pitting themselves against each other over it. It's an opinion, and as long as someone isn't saying to you "My opinion is that physical copies of books shouldn't be read because you're stupid" and doesn't directly insult you while voicing this opinion, then just leave it. Agree to disagree. Stop talking about either/or, and start talking about the content of the books you're reading, regardless of which platform you're choosing to use to read them. I just, I think it's a shame when people don't want to admit they read a book via an electronic copy, or that they listened to an audiobook (a whole new topic of discussion) and feel outside of the bookworld (whether it's Bookstagram or Booklr, etc) because they don't own a physical copy of the book they want to discuss. I will never not want full bookshelves, but some people don't share that dream, they want something that they can take all over the world with them and that never increases in weight no matter how many books they've read. Regardless of how you read, you're a freaking bookworm (something I'm kind of scared is dying off... and that you should be extremely proud of, especially since... well, insane movies going on inside your head at all times? That's pretty darn epic.) So just keep reading! Keeping training that beautiful brain of yours! This isn't a topic I wanted to write thousands of words on, because I'm scared this post is going to upset people. But that is definitely not my intention. The point of this is that I love reading both ways, and whether you read one way or the other, or even both, keep reading. I hope you enjoyed this(kind of pointless???) ramble from me! Tell me in the comments below which you prefer and why! I love to hear people's favourite thing about how they read, and not necessarily always what they read. Tell me a funny story about your iPad dropping on your face while reading, or getting a million paper cuts, ironically, from your favourite books. I love, love, love hearing from you guys! Lovely post! I have been discussing this with friends in the past days. Personally, I prefer physical books, but to be honest I've never tried eBooks because I'm afraid I'd really enjoy them. I would love to lighten the weight in my backpack but I can't resist the feeling of an actual book in my hands! There's nothing wrong with doing both! Generally, books for Kindle or iPad are super duper cheap, and if you only buy the books you really loved as a physical copy then you definitely save money in the long run. I wholeheartedly agree though, there's nothing better than holding a book! Haha I was told the other day that I wasn't a true bookworm because I havent read Harry Potter, which is all sorts of ridiculous!! I also love reading on my iPad! Whhhhhhaaaaatttt? Terri, I'll totally summarize each book for you so you can hold a conversation and not have to deal with that nonsense?! But really, if the HP books don't interest you, why read them? Silly people. Since I found out about the Kindle App, and then got my first e-reader in February, I've read all my books digitally. For me having an e-reader means having true access to the world of bookworms... Before that, I could never really enjoy reading because of my dyslexia, and the incredibly small letters they use in most printed books. That's actually an incredible point. I've apparently needed glasses for a while, but I always figured that my eyes were just tired from staring at a screen, so I'd always increase text size. I'm really glad that the apps have been so helpful for you! I love both :) I often do the same thing you do - buy it on kindle and if I love it I'll go out and buy the physical copies. I've also been known to buy the physical copies and then the kindle so I can keep reading in situations where pulling out a book isn't appropriate ;) like work! Lol some books are just too good to put down! I also love audiobooks - books in every form! And if I LOVE a book then I want to have it on every format possible so I can experience it in new ways. Reading is a personal thing - people should do whatever they like best and be happy with it! I love your post and I agree with you when it comes to the benefits or pros of reading in a device, I do it on my iPhone. I also do what you do, I have an ebook and if I like it, I get a physical copy because I like having them so I can reread them later. Thank you very much! How do you find reading on your phone? I tend to avoid it because it feels like it takes forever to read a chapter when the amount of text on the page is so tiny, but I'll read in any form as long as I can read! I'm kind of on the pro physical side. But I have a kobo ereader and I notice that I actually finish ebooks faster than physical books because they're easier to read. Wherever you are, you can take your ereader and if you forgot, no problem because I always have my phone with me. But there's something about the look of physical books. As a student I do buy a lot of ebooks. Some are free, they're cheap, don't need to be shipped and you can read them in a second. What better way to binge a book series than being able to buy the next one as soon as you've finished the previous. Yes! I definitely read a lot quicker with an electronic version, I guess because there's no page turning and the whole per cent thing definitely motivates me to read quicker. I don't think there's any denying that a physical book is freaking amazing and holding one is always great, but there are certainly pros to having eBooks. There always has to be people pitted against other people it's really ridiculous. Read what you want and how you want. I love books in all forms: print, e book, audiobook. I am usually reading books in multiple forms at the same time depending on what I am doing. Books are about content and as long as you are taking in the content that is reading. I barely go a day without this question popping up for me on social media, so I thought it'd be cool to share my entire opinion with my followers, I definitely think that it's ridiculous but the drama I see over dog-earring and such is also really bad! I think, that within social groups, there's always drama haha! I actually do a majority of my 'reading' via audio and then use a tablet or my phone for books not available in audio. For me, it's all about convenience. I always have something with me that I can read, ALWAYS! I am extremely grateful for all the options available. If it wasn't for audio, I'd hate to think about all the books I'd never been able to 'read' because I wouldn't have had the time! I can listen to books during my commute to work, at work and while cleaning, gardening, etc... I am fortunate this works for me as I know not everyone can listen to books. Also, I rarely buy books, I get all via my library, though lately I have actually purchased some e-books. I wish there wasn't drama involved in what form of reading is better. It's READING! Isn't that what brought us all together to begin with? Just like we all won't like the same book, we all won't agree on the same method. This is a fantastic post! I am an equal opportunity reader. I just want to read, every day, all the time. I read paper books, on my Nook and have recently begun reading on my phone. I say whatever works and keeps people reading.